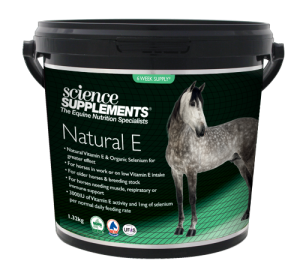 Vitamin E is a powerful antioxidant vitamin that cannot be made by the horse and must be obtained from the diet. Vitamin E is essential for healthy functioning of muscles, the immune system, reproductive function and the nervous system. Natural E, as the name suggests provides a natural source of Vitamin E which has up to double the biological activity than cheaper synthetic forms of Vitamin E commonly found in other brands. Natural E also contains organic selenium which is essential for the optimal activity of Vitamin E.
Please click on the image below for detailed information and feeding guides or call the helpline on 0345 504940.